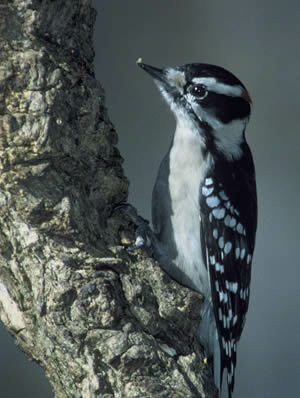 Featured Favorite Bird - Downy Woodpecker. Learn all about Downy Woodpeckers. ■ In winter Downy Woodpeckers are frequent members of mixed species flocks. Advantages of flocking include having to spend less time watching out for predators and better luck finding food from having other birds around. ■ In the winter time, the male and female Downy Woodpeckers split up and look for food. The males feed more on small branches and weed stems. Females feed on larger branches and trunks. Males keep females from foraging in the more productive spots. When researchers have removed males from a woodlot, females have responded by feeding along smaller branches. ■ Woodpeckers don’t sing songs, but they drum loudly against pieces of wood or metal to achieve the same effect. People sometimes think this drumming is part of the birds’ feeding habits, but it isn’t. In fact, feeding birds make surprisingly little noise even when they’re digging vigorously into wood. ■ Downy Woodpeckers have been discovered nesting in the walls of buildings. ■ The oldest known Downy Woodpecker lived to be at least 11 years, 11 months old. ■ The Downy Woodpecker clutch size is 3-8 eggs and just 1 brood. Incubation period is 12 days. Nesting period is 18-21 days. Eggs are completely white.